In November, Nestle increased its line of regional KitKats by just a hair by adding in a "Kobe Pudding" variety. I honestly did not know that Kobe was famous for it's pudding - which is more often referred to as "purin" in Japan and really looks and tastes like flan. My best research reveals that the sauce on Kobe's version is supposed to be flavored with some citrus and the basic pudding is less sweet. I'm betting that this KitKat will be plenty sweet, however, as my experience with white chocolate ones is that they are over the top in their sweetness. 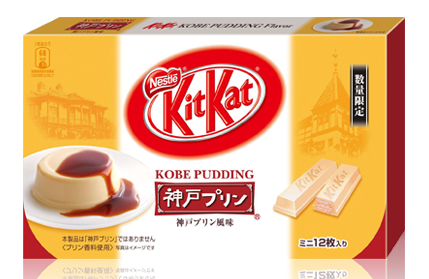 The strongest link between Kobe and pudding is probably the same as its link to wagyu (beef). The cows are supposed to produce superior milk as well as superior meat. However, this is my pure speculation and I'm betting that, no matter how the milk in Kobe might be, it's not going to really be reflected in a KitKat. Nonetheless, I'd be curious if any of my readers have sampled this and what they think of it. Please share in comments if you've had a taste of this.